Bulbs 1-3, borne on stout, ± horizontal rhizome, elongate, cylindric or conic, 0.5-1.5 × 0.7-2 cm; outer coats enclosing 1 or more bulbs, brown, reticulate, cells ± fine-meshed, open, fibrous; inner coats white, cells closely parallel, elongate. 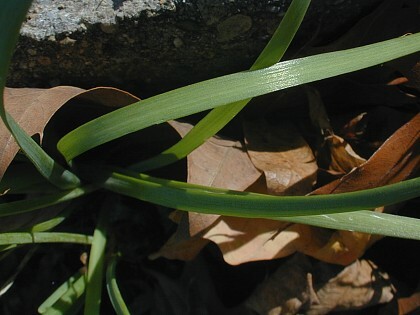 Leaves withering from tip by anthesis, 2-5, sheathing scape to ± soil level; blade solid, flat, carinate abaxially, 20-40 cm × 2-6 mm, margins entire. Scape persistent, solitary, erect, terete, 30-50 cm × 1-3 mm. Umbel persistent, erect, loose, 20-50-flowered, hemispheric-globose, bulbils unknown; spathe bracts persistent, 1-3, 3-7-veined, lance-ovate, shorter than pedicel, apex acuminate. Flowers substellate, 4-9 mm; tepals spreading, white with green or brownish midveins, lanceolate to elliptic, ± equal, withering and exposing capsule, margins entire, apex obtuse or acute; stamens included; anthers purple; pollen white; ovary crestless; style linear, ± equaling stamens; stigma capitate, unlobed; pedicel 10-30 mm. Seed coat shining; cells smooth, irregularly shaped, with ± sinuous walls. Flowering Jul--Aug. Roadsides and other disturbed ground; introduced; Iowa, Nebr., Wis.; se Asia. Allium tuberosum is cultivated in China, Siberia, and North America, and is reported to be established in New England. It may escape anywhere the species is cultivated.